How Many Foals Can One Mare Save? Angel, a palomino mare waiting to ship to a slaughterhouse collected 3 foals who's mothers had just been loaded. With her own filly beside her, she nursed all four little lives until she too was pulled to safety. The phone call came in, "Can you take a mare with a foal?" "Ah, yes, I have room." I replied and began to rearrange horses in my mind. Who would fit where, and who got along in pasture with one another. An hour later, the phone rang again. 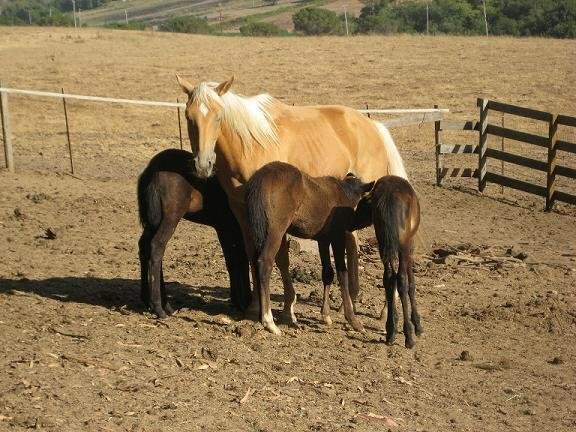 "Apparently this palomino mare has adopted a second foal. She is nursing them both. Do you have the room?" "Well, yes. It's OK they can come." I rearranged once again in my head and created a place for mom plus two. The next couple of days the volunteers prepped the lower pasture for foals. The third phone call was placed and I had to chuckle. This mare now had pulled in three orphans' and was nursing them along with her own. 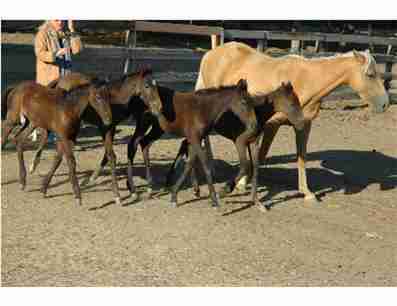 Shirley explained, "They are all bay foals, we can't tell them apart. She is nursing and treating them all equally. Three babies, less than 5 weeks, old had been ripped away from their panicked mothers, the mares loaded onto the "Death Truck" for the horrific journey. Trembling and frightened they stood clumped in a corner of the feedlot. It was then a very small miracle occurred. The soft-eyed palomino mare quietly walked over and stood between the babies and the truck. She had her own foal at her side, which was now peeking around from the far side of her flank. The little ones could smell milk, and smell mom, but usually a mare is very protective of her own foal, and of her own milk supply, and so the three stood quietly hesitating. This mare gently nudged the babies closer to her side. For comfort, one nursed, and jostled for position and nursed some more. Baby number two nudged in and took a turn, and then number three. 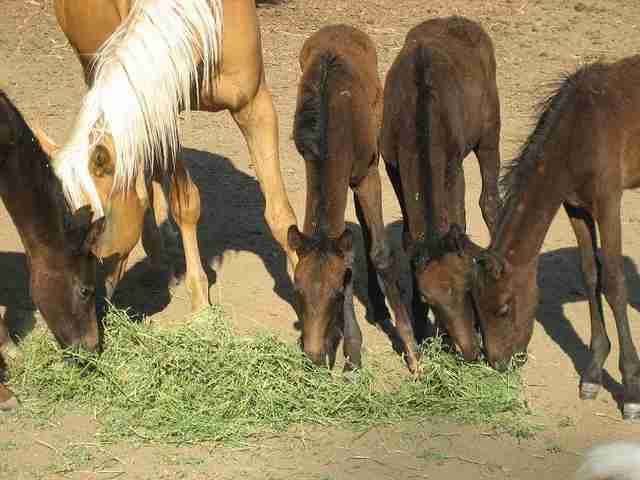 This amazing mare adopted all three of these orphans as her own. Upon their arrival Jillian and I sit on the fence boards observing their behavior. The Palomino mare seems content and pleased to be safe. The littles are not so sure. Fresh hay and water was available, yet the four stick together. Jillian hops down off the fence board and quietly approaches the herd. She has her back to them, and crouches down ever so slightly. It must be the good kid energy. In unison like gaggle of baby ducklings they creep toward her. One stretches his neck toward the back of her head. She decides to stay very low, almost sitting and remains very still. In a moments breath she has four curious noses sniffing her head, inspecting her ears, smelling her sweatshirt. I have to grin. Curiosity has its' purpose. It doesn't take long and the babies are looking forward to our visits. We are supplementing the mare we have now named Angel. We provide formula four times a day. They all continue to nurse. They all continue to thrive. Fast-forward one week. The day begins...up at six am...checking the milk buckets. Yippee, they're empty!! The babies have figured it out! When I go into the pasture to feed, they begin to nicker and they stand right behind me like little soldiers. Angel continued to take meticulous care of all her foals. As they grew and thrived, we gentled, vaccinated and found them forever homes. Angel too has been adopted and lives close by in Watsonville I see her occasionally and send her my love and appreciation. Her kindness was extraordinary and the fact she ended up almost sent to slaughter is unimaginable.